this post was inspired by a recent comment from a fellow mom on facebook that I was not meant to see, but did. 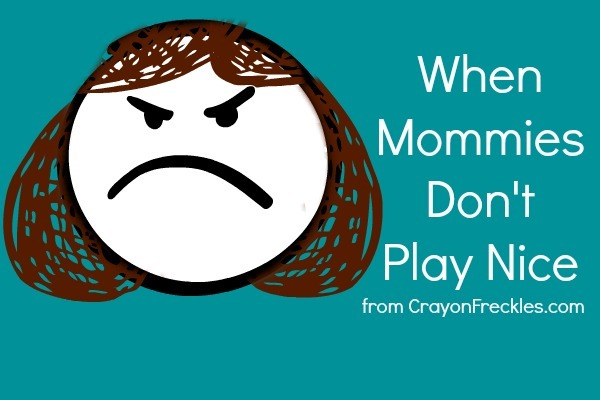 ever had a tiff, a beef, or a disagreement with a fellow mom? yeah... i've been there, done that. nothing is worse than feeling as though your parenting views are challenged or disapproved of by other moms. or to deal with passive-aggressive remarks or behaviors. or to experience downright snarkiness face-to-face. this head-to-head competition and criticism starts as early as the elementary years and seems to come to a head in the teen years. for many, it carries over into womanhood and subsequently motherhood. we all want to have healthy families, committed relationships, and foster successful, loving relationships with our children. there are so many contradicting reports on the benefits/drawbacks of controversial parenting topics such as: breastfeeding vs. formula, co-sleeping vs. sleep training, circ vs. un-circ, vaccinations vs. autism risk. with all those issues and questions floating above our heads, many of us question the choices we make in what we feel is the best interest for our children. so why make it worse by making each other feel bad and question our decisions further? the next time you come across a mom whose views differ from yours, ask questions, try to see things from her point of view, and accept her choices based on her desire for a positive relationship with her child. the next time you get that nasty look, the critical comments, or the not-so-subtle attack, take a breath. remind yourself that you are capable, that you come from love, and that you are deserving of respect for your parenting choices, no matter what anyone thinks. wow! my mom really loved me. Thanks for the shout-out! Yes, I agree, we need to "Mom-Up" and come together--because in the end we are all in it to do the very best we can each day for our child(ren). Here's hoping we can spark a change in lives of Moms everywhere! Kids Spell It Out: What is your favorite song? Kids Spell It Out: What is a Friend? Kids Spell It Out: What's your favorite memory?